In seeking to identify and calibrate sales performance each year, the Brendan Wood team consults the ultimate authorities, namely the customers, in this case Canada’s big ticket asset managers. The majority of big league Canadian equity buyers participate in Brendan Wood’s Shareholder Confidence intelligence program. While reviewing their confidence in Canadian stocks, portfolio managers simultaneously evaluate the quality of the sales professionals, analysts and traders who influence their investment choices. The client focus on sales coverage is sharp and insightful as only a real customer rating can be. 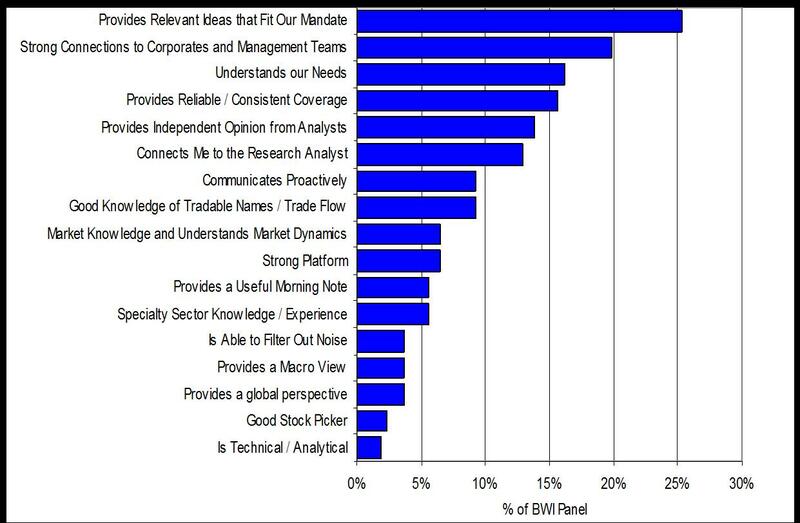 However, their evaluations are particularly acute since BWI’s debriefs focus on the value of sales coverage in the context of the corporate names in their portfolios and on their closest watch lists. Portfolio managers are clear about what they want from sales coverage and which sales professionals deliver where it counts. Customers are equally clear about what constitutes, mediocre and bottom gun coverage. Global asset managers allocate about 22% of their commissions (approximately $264M) for the sales coverage they receive on Canada stocks. At the average investor account about 70% of these “sales” commissions are allocated to the top three sales professionals covering the portfolio manager(s). Being a TopGunSM is no easy task in that a TopGunSM has to outperform as many as twenty competitive sales professionals in order to break into TopGunSM status. Anatomy of a TopGunSM Sales Professional? According to their asset management clients, a TopGunSM sales executive fully understands the client’s style and objectives and delivers actionable investment ideas aligned with the client’s portfolio. A TopGunSM sales professional understands and focuses on fertile investment terrain, is personally well connected with C suite executives of target investment companies and can effectively introduce them to his/her client. A TopGunSM delivers quality “independent” research analysis including analysts’ off line opinions and arranges timely interactions between analysts and clients. A TopGunSM delivers consistent coverage which clients can rely upon for the above mentioned services. Needless to say, clients believe TopGunSM sales professionals place their interests first. What Differentiates a TopGunSM Sales Professional? Menal Patel – Peters & Co.